Mary Jordan, daughter of William Jordan and Blanche Fullerton, was born in 1812 in Cabell County, (West) Virginia and died circa 1889 in Dickinson County, Kansas. She married Thomas Murphy in Tippecanoe County, Indiana, on April 21, 1829. 1829 Tippecanoe County Marriage Record between Mary Jordan and Thomas Murphy. Note that both were under age and needed permission to marry. The Murphys moved several times, first to Jasper County, Indiana, then to Missouri, then back to Jasper County. After the Civil War, they ended up in Dickinson County, Kansas, where both parents and sons Andrew and Francis made their homes until their deaths. Thomas was born on April 8, possibly in either 1808 or 1809 in Virginia. He was a great story teller who claimed to be over 100 years old and a veteran of the War of 1812, neither of which was true (although he may have served briefly in the military in 1827). He entered the Dickinson County Poor Farm on August 15, 1890, where he lived until his death on July 22, 1901. Mary and Thomas are both buried in Good Hope Cemetery, Dickinson County, Kansas. Mary is found in the censuses of 1850-TippecanoeIN, 1860-DickinsonKS, 1870-SalineMO, and 1880-DickinsonKS. She is possibly in the 1820-CabellVA census in the household of William Jordan and probably in the census of 1840-JasperIN in the household of Thomas Murphy. 1. George C. Murphy (aka George Washington Murphy) was born circa 1830 in Indiana. 2. Andrew Jackson Murphy was born on June 6, 1830 in Indiana and died on April 17, 1912 in Reading, Kansas. He married Minerva Reed circa 1862. Minerva was born on February 25, 1844 in Jasper County, Indiana, and died on January 12, 1909 in Junction City, Kansas [Obituary]. Andrew and Minerva are buried in Highland Cemetery, Junction City, Kansas. 3. Francis Marion Murphy was born in 1833 in Indiana and died in 1878 in Kansas. He married Turza Jane Brown, daughter of Nathan Brown and Anna Proud. Turza was born on August 6, 1838 in Indiana. On March 22, 1880, Turza married Stephen LaForge, whom she divorced in 1892, Turza died on May 10, 1893 while on a visit to Plattville, Colorado. She is buried beside her first husband Francis in Good Hope Cemetery, Dickinson County, Kansas. 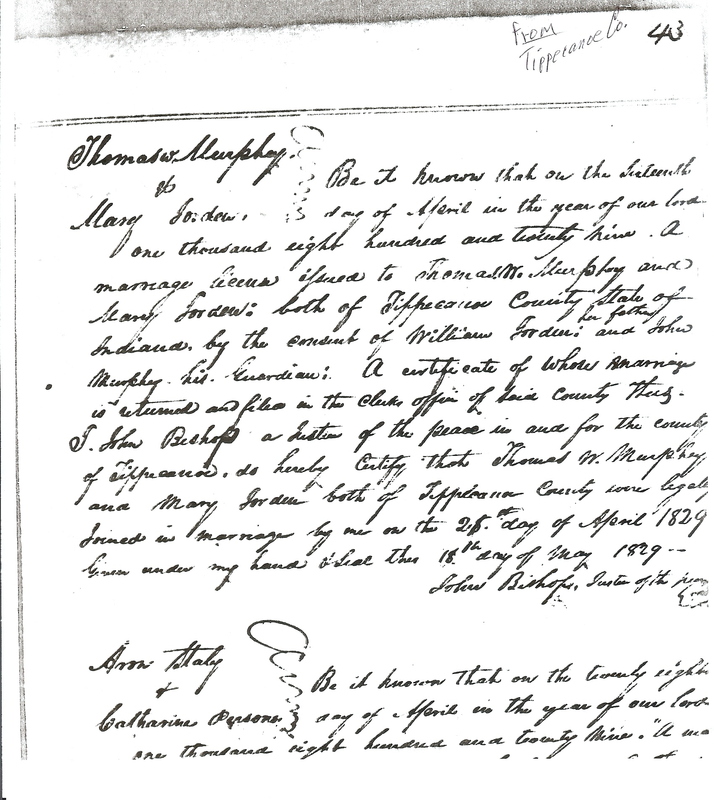 1 Proof that Mary Jordan Murphy is a daughter of William and Blanche is found in several court and land documents, including Tippecanoe County Court of Common Pleas appeal to the Indiana Supreme Court, November 1850, in which Mary, wife of Thomas Murphy, is named as one of the heirs of William Jordan. Also, Tippecanoe County Land Record Books “W” (pp51-53) and “29” (pp612-615), both dated February 1847, and Book “29” (p108) dated April 1850. April 1829: Tippecanoe County, Indiana, marriage record – Thomas is under the age of consent (21), so his guardian, John Murphy, gives permission for him to marry. Year of birth (YOB) can be no earlier than 1809. 1840: Jasper County, Indiana census – Thomas is between 30 and 40 years of age. YOB: 1800-1810. August 1850: Tippecanoe County, Indiana census – Murphy family is listed twice, in one his age is 37, in the other he is 42. YOB is either 1813 or 1808. August 1860: Kansas Falls, Dickinson County, Kansas Territory census – Thomas is listed as being 50 years old. YOB: 1810. August 1870: Marshall township, Saline County, Missouri – Thomas is 68 years old. YOB: 1802. March, 1875: State census of Dickinson County, Kansas – Thomas is 68 years old. YOB: 1806. June 1880: Fragrant Hill township, Dickinson County, Kansas census – Thomas is 86 years old. YOB: 1794. April 28, 1888: The Junction City Weekly Union reports that “Mr. Murphy of Chapman” (Thomas) received a letter from his brother whom he had not seen since 1833, adding that Thomas was 95 years old and had served in the regular army in 1827. YOB: 1793; he served in the army at the age of 34. June 5, 1896: The Abilene Weekly Chronicle reports that Thomas Murphy, one of the inmates of the county poor farm, turned 100 years old on April 8th. YOB: 1796. 1900: Dickinson County census – Thomas reports his age to be 103 and that he was born in April, 1797. YOB: 1797. July 1901: The Dickinson County, Kansas Register of Deaths records that Thomas Murphy, a widower, died on July 22, 1901, of heart failure at the age of 105. YOB: 1796. Tombstone in Good Hope Cemetery, Dickinson County, Kansas, reads “Thomas W. Murphy, 1794-1901.” It also says that he was a Private in the Kentucky Volunteers during the War of 1812. Each of the sources above provides additional information to show that the same Thomas Murphy is being referred to throughout. The censuses all list other members of his family, newspaper articles list his residence, the 1901 entry in the Register of Deaths is accompanied by obituaries that refer to his son, and his tombstone includes the name of his wife, Mary, and her correct year of birth, 1812. 3 Sources for Mary Jordan and Thomas Murphy and their family include Tippecanoe County Marriage Records, Aunt Mollie’s Diary, 1820-1910 U.S. Censuses, 1875-1905 Kansas State Censuses, History of the Town of Remington and Vicinity, “Dickinson County Poor Farm Records” transcribed by Mary Jane McIntire in 2000 and published in the Autumn 2002 issue of The Tree Climber, the quarterly publication of the Smokey Valley Genealogical Society; Dickinson County, Kansas Death Records, Tombstones.